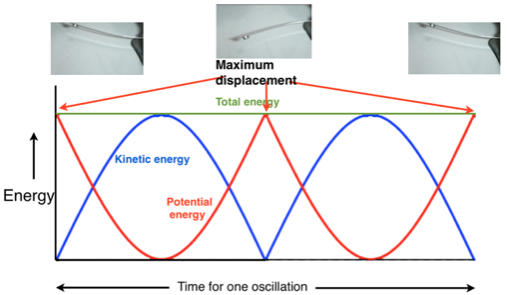 At each end of the oscillation, when the displacement is at a maximum, the mass is momentarily still. It has zero kinetic energy but maximum potential energy. In the case of a spring (pictured here) this potential energy is stored elastic energy. In the case of a pendulum it is gravitational potential energy. At the centre point of oscillation the speed of the mass is at a maximum. 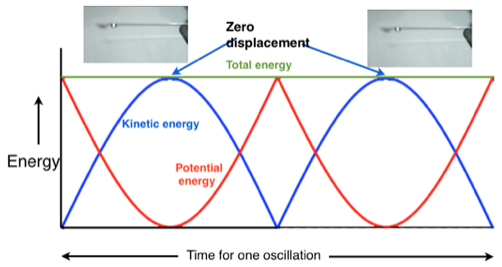 The kinetic energy is therefore at a maximum and the potential energy is zero.